* Marty Turco is a solid goalie who has put the Stars back in the mix. But, you could put together a low-light film of his meltdown moments that would make you cringe, eh? Very Brett Favre like, where a high-light film could rival anyone's, but the low-light film would have you wondering "what was he thinking?" The goal last night that was gifted to the Blues was just the wrong night to do it- With this depleted roster, one goal or one mistake can break the entire night's plans. And, last night, that one hurt badly. * The math is beginning to be difficult for the Stars. I am not saying they cannot make the playoffs, but I am saying it is getting progressively more difficult again. To play 3 home games in the last 7 days and to get 0 points out of the exercise is devastating. Now, they need to get points on the road in the next few weeks to compensate for these blown opportunities. Know this: the playoffs for the Stars have been going on for quite a few weeks already. * Steve Begin is badly needed as another depth forward and a guy who can play center. Keep your expectations low, but understand that with games coming fast and furious (5 in the next 7 days) this team needs bodies of NHL quality and experience. Almost 400 games makes him a welcome addition just to help row this boat. * Could TJ Oshie score that goal if he had 10 more chances from that angle? That goal was quality. * Hockey is a simple game. Put the puck in, and keep it out. All the shots on goal and odd man rushes and big hits and faceoff wins are important - but at the end, they are all window dressing on certain nights. Put the puck in, and keep it out- The Stars have scored 2 goals in 3 games. 42 shots last night are nice, but you have to finish. * 2 more playoff games this weekend - Ducks on Saturday, Penguins on Sunday. Things are getting critical around here. The best thing about the triumphant return of Tiger Woods may be the new commercials! The new Nike Golf commercials are genius! I've seen 2 so far and laughed out loud at both of them. Both set in the locker room. One of other PGA players shaking their heads as a sign of the quiet, more competitive days are now gone with Tiger back on the course. The other with Tiger alone, whistling the theme from Rocky. I damn near got goose bumps and am ashamed to admit it. Darren Clark – Thursday 1:02 ….EDIT: Tim Clark. Sorry. I am an idiot. Good to have you back, Tigre…. I know I'm not in an individual sport. If I were in track and field maybe I would have won something big by now. ... Sure it's bitter sometimes when a teammate doesn't invest the necessary time. The best example was Shawn Bradley. He would some times come to training camp and not had a ball in his hands for four months. But what can you do? There is no rule. Everyone needs to figure out for themselves how to stay fit. Well, we wanted a playmaker who had been around and already seen everything. I also hoped that Coach (Avery Johnson) would let him play his way, that we would play quicker and have more fun. But just the opposite happened. Avery pushed his style on Jason. It was tough throwing a guy like him into a system which he didn't really like. The best thing would be me carrying the team to the title. But the other teams have gotten so strong, also through some unfair trades -- Pau Gasol to Los Angeles and Kevin Garnett to Boston. Maybe I will see if it helps changing teams in like three years. Maybe it won't be fun any more or I can't keep up with the athleticism anymore. Maybe I will play in Europe again. I can imagine all of that. What Karl Malone did back then -- heading to L.A. after all those years in Utah -- yeah it was a little questionable. But when you want the championship so bad, then you can't rule out a move like that. And the Mavs taught the Bucks a lesson …. A night after getting overwhelmed in San Antonio by a Spurs team missing two All-Stars, the Mavericks returned to American Airlines Center to blister the Milwaukee Bucks, 116-96, Wednesday. The Mavericks got diverse production from numerous players along with a little payback for the 34-point blowout they absorbed last month in Milwaukee. But it hardly seemed satisfying, not after what happened the previous night, when the short-handed Spurs held the Mavericks to 76 points and won by 17. But a win is a win, and at this point, with the playoff picture changing every day, they all count. "After last night, we needed this," said Josh Howard, who paced the Mavericks with 27 points. "Coach [Rick] Carlisle reminded us of what happened the last time we played Milwaukee. I think everyone took that as a personal challenge." Five other Mavericks reached double figures against a Bucks team that was missing center Andrew Bogut and is fighting to hang on to the last playoff spot in the Eastern Conference. The Mavericks fell behind, 15-7, in the first quarter, then outscored the Bucks, 58-26, the rest of the half. Their giant cushion was safe throughout the second half. It would shrink to 94-83 early in the fourth quarter, but a flurry of buckets ended that brief glimmer of drama. Perhaps the best bit of news for the Mavericks was Dirk Nowitzki seemed to snap out of what had been a three-game slump. He hit six of 10 shots, and while he only scored 14 points, it was significant that he beat Milwaukee's constant double-teams with a couple of nice moves in the fourth quarter. An under-the-radar ace on a talented, deep team, John Lackey somehow has avoided attention throughout a remarkable big-league career. That may be about to change in 2009. Lackey, 30, quietly has been one of the most dominant pitchers in the American League the last four years. He also has been a bargain for the Los Angeles Angels. That almost certainly will change. In an era when pitching is king—when isn't it?—Lackey has gone 58-30 with a 3.42 earned-run average the last four seasons. He has earned $17.5 million for that contribution, and checks in at $9 million this season. This is the last year on a $26 million deal the Angels were wise enough to offer him at the start of the 2006 season. It gave him financial security in exchange for two years of arbitration and one of free agency. Now, like wide receiver Rod Tidwell in "Jerry Maguire," Lackey is telling the Angels, "Show me the money!" The Angels would love to keep him, but it remains to be seen if they will offer him market value to keep him from free agency next winter. Assuming Lackey has a solid 2009, it's hard to see him taking less than A.J. 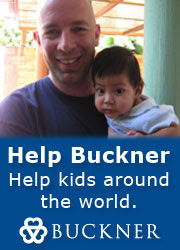 Burnett, who received $82.5 million over five years from the Yankees this winter. The Angels face a similar crossroads with Vladimir Guerrero, who has anchored their lineup since 2004. He is also eligible for free agency after this season. It's always good to know whose contract is up as those guys are likely to be especially motivated to produce big years and to be traded at midseason if their teams are not competitive. It's hard to see this guy leaving the team that took him with the first overall pick in the 1990 draft, but stranger things happen. He turns 37 in April, which makes age an issue in the length of a new contract, but he's still among the game's most productive third basemen. Like newly minted gazillionaire Mark Teixeira, Holliday is an absolute RBI machine. The recent trade from Colorado to Oakland gives him a chance to show his gaudy totals come from more than Denver's thin air. The A's could put him on the market in midseason, creating a feeding frenzy. Another serial run-producer, the 36-year-old Delgado is getting to the point in his career when he could make more sense for an American League team than for one in the National League. His injury history precludes an abundance of long-term offers. But his talent could get him a big short-term package if he avoids the DL. He's coming off one big contract and looking for another one, a good feat at 29. He's a strong candidate for a trade if he isn't extended. He has been tainted by the steroid scandal and knocked as a one-dimensional player, but he turned in an excellent 2008 season in Houston. He did a solid job filling Manny Ramirez's oversized shoes and could be in for a big contract with Boston. The development of prospect Josh Reddick could influence the decision-making process. A dozen others: CF Rick Ankiel, Cardinals; OF Reed Johnson, Cubs; RHP Jose Valverde, Astros; SS Khalil Greene, Cardinals; INF Mark DeRosa, Indians; RF-DH Gary Sheffield, Tigers; C Brian Schneider, Mets; RHP Justin Duchscherer, Athletics; RHP Brett Myers, Phillies; LHP Mike Gonzalez, Braves; RHP Kevin Gregg, Cubs; and RHP Jose Contreras, White Sox. Eisen’s Run – now on Youtube! Wow. That was really sad. Not good at all. My curiosity of what to actually make of this team continues. They pound someone, I begin to get optimistic. They get pounded by a team without their two best players, I lose all optimisim. They are neither fish nor fowl. They are neither good nor bad. They are a stereotypical 7 or 8 seed. The Spurs didn’t have two of their top three players. And the Mavericks still didn’t have a chance. San Antonio’s 93-76 win Tuesday at the AT&T Center was either a tribute to the star-challenged Spurs or an indictment of the Mavericks. It depends on your perspective. Rick Carlisle’s perspective was blistering. "We threw about six, tough minutes at them in the second quarter. The rest of the time, they dominated the game with their disposition and how they played. Nothing about this effort leads you to believe the Mavericks are serious about their desire to move up in the standings. A team that hasn’t beaten a Western Conference playoff contender on the road since Christmas night couldn’t beat a Spurs team that took the court without Tim Duncan and Manu Ginobili. What appeared to be a golden opportunity for the Mavericks turned into a bitter disappointment. 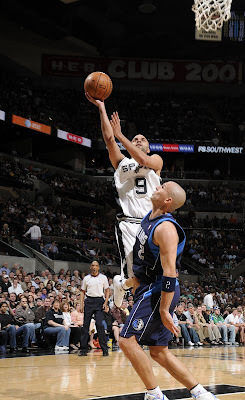 Tony Parker picked up the offensive slack, torching the Mavericks for 37 points. The Spurs didn’t let the Mavericks get out and run — a team that averaged 17.9 fast-break points in the previous 11 games had only seven — and turned it into a bump-and-grind affair. "It’s a gift that Duncan didn’t play, and we didn’t take it," forward Dirk Nowitzki said. "It’s a frustrating, disappointing loss. "It was just an embarrassing effort." Something else became clear: Nowitzki is in a slump. The Mavericks star finished with just 14 points as the Spurs fronted him in the low post, ran an extra defender or two at him every time he put the ball on the court and dared the Mavericks to beat them with their weak-side shooting in Jason Terry’s absence. But it’s not just the Spurs. Nowitzki has averaged 11.7 points and gone 15-of-46 from the field (32.6 percent) in the last three games. The absence of Duncan and Ginobili did more to throw the Mavericks out of sync than the Spurs. San Antonio scrambled the game and the Mavericks lost their offensive identity in the process. The Spurs took the lead 3:07 deep into the first quarter and never gave it up. "From the start to the end, we weren’t us today," guard J.J. Barea said. "They played harder. They did everything better. They outplayed us in every aspect of the game." Matt Bonner's first prominent moment as a Raptor occurred on December 2004 during an exciting game at the Air Canada Centre. Extending for a rebound, he knocked all-star Kevin Garnett from behind, sending him sprawling to the ground prompting the two players to get into a heated exchange. The crowd chanted "Bonner, Bonner" as he was ejected from the game. This immediately established Matt as a fan favorite with Raptors fans rallying behind Bonner. Between the No. 7 green and No. 8 tee, Woods’s path was lined with well-wishers. One shouted, “Welcome back, Tiger!” Without slowing his gait or averting his gaze from the yardage book in his hands, Woods replied, “Thank you.” His first match was 24 hours away and he was already feeling the rush. Comedy Alert: Rich Eisen runs the 40 against the NFL Studs …Do yourself a favor and watch this. *O’Rourke is credited with the first hit in the first National League game on April 22, 1876. In 1904, at the age of 54, he appeared in one game for the New York Giants. This gets me thinking about how badly the Brad Richards injury is hurting the whole scheme of things, and with Mike Modano out last night, this looked a lot like a team talent-wise that might have to work hard to win the AHL title. "...this looked a lot like a team talent-wise that might have to work hard to win the AHL title." You've got to be kidding. To say that it's only the four biggest names that give the Stars NHL-quality talent is ludicrous. Do you think that Ribeiro, Lehtinen, Ott, Robidas, Daley and Sydor belong in the minor leagues? Can we hope that, say, Eriksson, Neal and Grossman might somehow, some day, become good enough that the Stars don't have to just shut down when Modano, Zubov and Morrow retire? Or is that what your column was about -- wherever are they going to get enough talent to keep the team going, despite the minor-league quality players they've got now? Ralph and Razor got it right last night when they said, repeatedly, that the Stars were outplaying the Sharks in every aspect of the game. It's true that the Sharks, not the Stars, got that one perfect shot that got through (and 'perfect' is what it took to score), but the Stars -- the whole team -- kept the number one team in the league shut down for two-and-a-half periods. I'm not suggesting that it's not important who wins. But the fact is that in every sport, any team can beat any other team in a single game, and sometimes the final score doesn't mean anything more than that. You can't be saying that the Stars aren't NHL caliber just because they lost a game. So what, then? The rest of the team, besides the injured four, doesn't have what it takes? I read your comments about Monday night's game. Yes, they outplayed the Sharks. Yes, they didn't score a goal. Yes, they lost. But saying they look like a team that would have to fight to win an AHL title? That's a little over-dramatic, even for you Bob. The Stars deserved a better fate last night, but getting shutout 1-0 by the best team in the entire league with one of the best goalies isn't exactly something to cry about. Plenty of teams do it with a healthy roster. In most people's eyes, we were supposed to lose that game. Given the fact that we were really skate-to-skate with them all night says something considering the people out of our lineup. They had a tink that went in (I heard it on Setagucchi's goal), our tink didn't go in. That was the difference in the game. Now, if the Stars play like this against the Blues and Ducks, and STILL lose, I'll start to worry. Until then, I applaud the way the Stars played against the Sharks, even if the result wasn't favorable. Cindy and Sharon (and maybe you) took offense to my phrase that suggested the Stars roster on Monday night might not win the AHL title. Ok. Let’s discuss. First, I think the AHL is the highest level of hockey in the world short of the NHL (perhaps that will inspire another debate!). There are dozens of AHL players right now who are NHL-Caliber. They just need the same chance that many that are in the big leagues have been given. So, when I say the Monday Night Stars team might not be able to win the 16 games or 4 best-of-seven series to win the Calder Cup should not be considered the biggest insult ever levied. This is not independent league hockey or some beer league. This is the AHL – where many future NHL stars are currently playing. Second, I think it goes without saying that most of the Stars roster from Monday night have been in the AHL in the last 24 months or have been on the very edge of the NHL as healthy scratches this very season. On the blueline, Grossman, Niskanen, Fistric, and Sydor are all players who are either new to the league, or in Sydor’s case was a healthy scratch in 8 of the first 20 games for the Penguins before the trade. Up front, Sawada, Barch, Peterson, Neal, Sutherby (scratched often in Washington and Anaheim), Parrish, Lundqvist, Brunnstrom and Eriksson are all either relative newcomers or fringe NHL players over the last few seasons. That leaves Ott, Riberio, Lehtinen, Daley and Robidas as skaters who have neither been out of the league or out of the lineup due to being healthy scratched in the last few years. When only 1 defense pairing and 1 forward line are considered “NHL Locks” with regard to being both proven and accomplished, that is why I threw out the AHL comment. It is not to say that Eriksson or Grossman or Neal are not NHL caliber, because they surely are, it is just to say that the reason NHL teams are better than AHL teams is not the worker bees on the 3rd and 4th lines. It is the top end talent that makes the difference. And without Richards, Morrow, Modano, and Zubov in the lineup, a majority of your top end talent is gone. I think this is a fairly easy point to make not just about the Stars, but about any pro team in any sport. Think the Mavs would win a European league if Dirk, Howard, Terry, and Kidd were all out of the lineup at the same time? How about the Rangers winning the AAA title without Young, Kinsler, Hamilton, or Millwood? It is not an insult to the rest of the team that they need their best players to be their best players. That is reality. If it wasn’t, then everybody would be paid the same money. Players get larger salaries for larger abilities, so we should also recognize their absence will result in logical declines in the team’s overall ability. Tippett can’t admit it, and neither can the team. But, when you are depleted of your stars, you must play perfect with what you have to get results. The Stars ALMOST did on Monday. We should be proud of their effort. But, we should not be surprised when the Sharks still had enough to beat them on a night where the Sharks were outplayed. The Stars played their guts out, but could they do that night in and night out over 2 months to win the Calder Cup or more importantly to make the NHL playoffs down the stretch here? Let’s just say Marty Turco will be busy and will need to be locked on. So, I hope that was clearer as to what I meant. I think they should be able to beat St Louis with this team, because St Louis is not San Jose. But for this team to make the playoffs, they are going to need either their talent back – Modano should play Thursday – or some much needed reinforcements. Aggies finally have a voice! Bango, the Milwaukee Bucks' popular mascot, hurt his right knee during last weekend All-Star Weekend in Phoenix, and will need surgery in March. The Bucks announced this afternoon that Bango will still be seen around the Bradley Center, but fans will miss his "gazelle-like dunks and agile maneuvers." "He will miss few - if any - home games and the Energee! Dance team, Hoop Troop, Rim Rockers, Air Bango, Super Force and newly formed Bucks Wild! percussion drumline will continue to fill the court in support of Bango," the team announced. The news that Bango had hurt himself represents the latest in a string of injuries affecting the Bucks. Andrew Bogut and Michael Redd are out for the season, and Luke Ridnour was out for several games. In an interview that lasted more than a hour, Jones covered subjects ranging from the perks and experience of the new stadium to the draft, to Adam "Pacman" Jones to the '09 season to, yes, T.O. Why should fans be optimistic about the '09 season? We'll get better quarterbacking. Tony (Romo) is early in his career. I'm not going to say that we're gonna have him for 16 games and through the playoffs. We all know the injury factor isn't something you can plan on. We need to do a better job when we don't have him at quarterback. Last year was a good experience for us. Defensively, I think we've got a chance with some things that Wade is doing. We've got some things that will make us a better defense. Special teams, we did make a change there. We didn't go status quo. I think we'll be improved. It will be real nice to get our punter back. Everybody had injuries; we had some material injuries last year. I think it's not wise to say we're not going to have some injuries next year but maybe we won't have them impact us in some of the ways they did. Do you need to find another quarterback, veteran or rookie? It's a real priority for us to get where we'd like to be with our backup situation at quarterback. A real priority. Not necessarily. A veteran may be too much of a veteran. You say, 'Well, you roll the dice a little bit and get by on two or three games.' You can make a case that you don't (win) a game you should have and it might have meant the Super Bowl. It could have meant that much to us to have won one of those games that we didn't win when we didn't have Tony. We were lucky to have won the one we did without Tony, frankly. We have to have improvement there. Why don't you think the locker room issues are an issue? dysfunctional on the face of it and won world championships. In a pecking order of important things about your team, that is very low on the list. But our locker room issues did not impact in any way our 9-7 record and what we're doing. In any way. That's why I don't get uptight about it. What is the high priority? You hinted last week that you plan to keep Terrell Owens. Do you? You got my drift. And that's all I want to say about that. season; are you concerned about that as it relates to Jason Garrett? I know first-hand where (Romo) is with Jason, pointedly. I know where they are on a working relationship basis. OK? I know you don't have one sitting over here throwing one under the bus. That's just not happening. That's why I'm not concerned about it. Does Wade need to be 'harder' or more disciplined? Wade's style, and I'm talking about both directly with players but just his style as a coach, I've seen that win championships. What we need Wade to be is him. But I've seen him bite and bite good. It's a mistake for anybody that he won't and doesn't disagree with me. He can be none abrasive, but he can be very firm on his points. Do players need to fear if they are late for a meeting or something there will be a penalty? Yes. But do they need to feel that? Yes. Do they need to feel it more than they have in the past? I'm not agreeing to that. But is that an important aspect of being considerate to everyone else as far as meeting attendance or rules relative to how you monitor injury. I believe that very strongly. I think you have to have fines. Because I know that most of our fans know that in order to manage a lot of people and certainly manage a team that discipline needs to be a part of it. I would hope that we can correct that perception. I don't believe that is the case or is going to be the case. How do you correct that perception? I'm not so sure about that. I don't want to go as far as announcing every fine we give. That violates some other things I'm not for. Is the Cowboys' relationship with Pacman Jones done? I'm not going to go far. That's pretty sweeping; it covers a lot. He's better off; we're better off him not being on our roster. We're better off. Davis. What are their chances of coming back? I think every one of those you just mentioned I would like to think have a chance to be with the Cowboys. Rolling the clock forward, I would like to think the circumstances would be that we could figure out a way for them to be with the Cowboys. You want them but, but the numbers might not allow it? Are your draft priorities safety, linebacker, defensive line and backup offensive line? Those could be special teams guys as well so I would certainly say those are positions that we would look to that could help us this year as well as be potential players for the future at those positions. The Stars played their tails off last night, but the only thing that matters is if you can get that piece of vulcanized rubber over that goal line. Were this boxing, the Stars would have won a split decision. But, it wasn’t boxing, so only the goals scored matter. And the Stars could score none of them. Regardless, with the deadline only 10 days away, is it time to discuss the Stars willingness to pull the trigger and get another piece to help push the team over the finish line? There may be very few deals to be made, frankly, as all 15 seeds can still feel like they have a chance in the West, and why, then, would they make a trade with another team in the West? But, let’s set that issue aside and just ask the question of whether ownership (Tom Hicks) has put a hard ceiling on the budget this year, or if desperate times call for desperate measures? My rationale is this: In this rough economic climate, you can certainly understand Hicks’ reluctance to spend more after all he has poured into this team (taking on the Richards contract, the entire Avery debacle, etc.). But, the reality here is this: If you make the right deal, you insure the revenues of playoff hockey on a per game basis, and also on the premise that a playoff team reaps off-season credibility from its consumers in the form of season ticket renewals and other similar cash infusions. If you don’t make a deal, you might miss the playoffs altogether. Of course, there are no promises either way, but if a team looked like a team that needed a little help from its owner, it might be the Stars right now, who face a stretch run that is awfully rough – without 3 of its best players being anywhere close to returning to the team. Who is available is an issue – and so are what the costs would be from a player/draft pick standpoint, but the real question here is would this team be willing to pay the cash to bring in much-needed reinforcements right now. Playoff races aside, there will be trades on Mar. 4 and based on the discussions taking place now we've compiled a list of the Top 10 most interesting trade possibilities. No. 10 - Alex Kovalev. NHL executives are curious about his future in Montreal. If Bob Gainey wants to cut ties, there are teams willing to consider the risk. No. 9 - The Oilers are believed to be one team interested in Kovalev and sources say Edmonton forward Erik Cole could be worked into a package as the Oilers search for a top line forward. No. 8 - Chris Pronger. How the Anaheim Ducks play over the next two weeks will determine whether Pronger is truly in the mix. The most likely scenario is that the Ducks hold on to Pronger for their playoff push and reconsider trading him at the draft. No. 7 - Ryan Whitney. With the return of Sergei Gonchar, the Penguins have a stockpile of blueliners and league sources say Whitney could fetch the quality forward Ray Shero is seeking. No. 6 - Olli Jokinen. The Phoenix centre is available but NHL GMs wonder about a 10-year player who has never once been in the playoffs. No. 5 - Jay Bouwmeester. The Panthers have talked to a number of teams and has a variety of trade scenarios to consider, but it's possible Bouwmeester has a change of heart and stays. No. 4 - Nik Antropov may headline the parade of players out of Toronto. Brian Burke has established the asking price for Antropov - a first round draft pick. No. 3 - Philadelphia prospect James van Riemsdyk. The University of New Hampshire forward, picked second in 2007, has been linked to Atlanta in a deal that would see a goalie going to the Flyers. Don Waddell continues to rebuild, swapping Lehtonen for a prospect such as Van Riemsdyk would have to be seriously considered. No. 1 - Ryan Smyth. Colorada needs to cut payroll and Francois Giguere is talking to teams about Smyth. The Avs won't ask Smyth to waive his no-trade unless there's a decent deal tabled. Teams are working on their offers now. These are big names that may require big deals for teams to pull the trigger. However, this list of 10 present some powerful possibilities. CBC’s Trade Deadline primer …. You could be witnessing the best free-throw shooting season in NBA history. Take a look at the team free-throw rankings. Six teams are shooting better than .800 percent. That's never happened. The best ever is four teams in the 1990-91 season. "You told me something I didn't know," Heat coach Erik Spoelstra said. Not only that, no team is shooting worse than .710 on free throws this season. That hasn't happened since 1992-93. The worst free-throw shooting team this season, Orlando, is making close to 72 percent of its free throws (.718). The league leader, Toronto's Jose Calderon, is shooting .981. If he finishes the season anywhere near there, he'd smash the NBA's all-time best single-season mark of .958 by Houston's Calvin Murphy in 1980-81. And get this: To break into the top 10 in free-throw percentage this season you have to be shooting at least .894. If it finishes this way, it'd be the highest minimum percentage ever to finish in the top 10. Currently it's .891 in the 1990-91 season. There's no athletic explanation for the improvements, although some have tried. 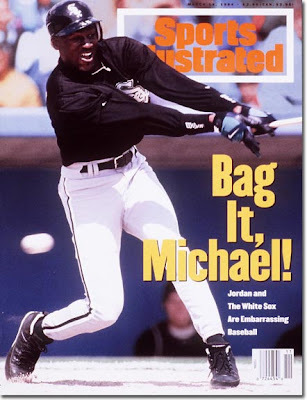 One of baseball's great concerns is the decline of African-American ballplayers, particularly in the inner cities. 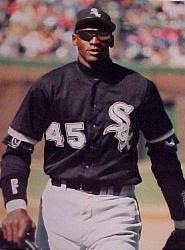 From a golden era in the 1960s when blacks formed the National League's core of stardom -- Willie Mays, Hank Aaron, Frank Robinson, Bob Gibson, Willie McCovey, Ernie Banks, Billy Williams, many more -- the percentage of African-Americans had dropped to just 9 percent over both leagues last season. There isn't a single star, let alone a super-talent, among the NBA's 45-odd white players who were raised in America (as opposed to Dirk Nowitzki, Steve Nash, Manu Ginobili and others from foreign countries). The only player even remotely close to the league's elite is Minnesota's Mike Miller, who had some big years in Memphis but is now averaging around 9 points per game and on the trading block. Otherwise, you're talking about Brad Miller, Kirk Hinrich, Jason Kapono, Kelvin Korver, Brent Barry, David Lee, Mike Dunleavy, that sort of thing, with some promise held for T-Wolves rookie Kevin Love. That reflects a 10-year drought -- or since Stockton made the third team in 1998-99. And it doesn't include the likes of Bill Bradley, Bobby Jones, Doug Collins, Jack Marin, Kiki Vandeweghe, Jeff Hornacek, Jack Sikma, Bill Laimbeer, Dan Issel, Brian Winters, Ernie DiGregorio, Rudy Tomjanovich, the Van Arsdale twins and Jeff Mullins, all of whom were far more influential than anyone playing today. Hell, you could almost throw Don Nelson in there. If you love top-quality European soccer, then this is one of those weeks you dream about. The UEFA Champions League returns to action on Tuesday as 16 teams do battle in home-and-home series to move on to the quarterfinals. In case you forgot (and it has been two months so don't feel bad) the draw for the Round of 16 set up a parade of tough match-ups featuring some contests worthy of being semifinals and finals. Manchester United travels to Milan to face Inter in the best match-up of the round as Jose Mourinho and Sir Alex Ferguson renew acquaintances. Tuesday's dance card is filled with great match-ups, including Barcelona-Lyon and AS Roma-Arsenal. Wednesday doesn't disappoint either, as Chelsea faces former manager Claudio Ranieri and Juventus while Liverpool and Real Madrid square off in a battle of second-place teams holding on to faint domestic title hopes. All-America wide receiver Michael Crabtree of Texas Tech addressed the stress fracture in his left foot at the NFL scouting combine Sunday, saying he would give the league a 40-yard dash and then have surgery to repair the injury. A routine combine physical last week turned up the stress fracture, which Crabtree said was an old injury. He said he has lived with the injury for a year and that it did not cause him any pain last season when he caught 97 passes for 1,165 yards and 19 touchdowns in winning his second Biletnikoff Award. NFL sources said Crabtree, a former Carter star, would need surgery to have a pin placed in his foot and that he would be sidelined for 10 weeks. But if he underwent the surgery now, Crabtree would be unable to give the NFL a 40-yard dash time until May. The draft is April 25. Crabtree's private workout is scheduled for March 26 in Dallas. He'll run the 40 then. Crabtree returned to the media room at the combine Sunday for a second time to deliver a five-sentence, 21-second statement on his injury. He closed with, "I'm looking forward to going to the next level." Crabtree decided to skip his final two seasons of eligibility to turn pro. 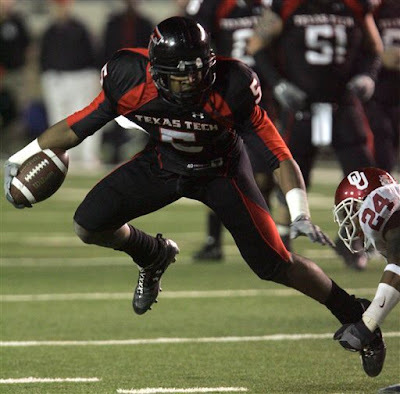 He left the Red Raiders as the school's all-time leading receiver with 231 catches and ranks eighth in NCAA history with 41 career touchdown receptions despite playing only 26 games. Since he is a junior, he has no official time on record. This is crucial. He is so talented, but the NFL does not believe game film, generally; They want their 40 time. Does Crabtree have the long speed at their level? Here is what is at stake: millions, and millions, and millions. In the mocks prior to this news, Crabtree has been in the top 5, most notably in Seattle at #4. Without a 40 time, he could slide. How far? Ask Aaron Rodgers, Randy Moss, or Warren Sapp what that could mean. I don’t think he would slide that far if he had surgery today, but the reason he is not getting surgery is that he will post a time, show his determination to run through a fracture, and preserve his top 5 status. The Oakland Raiders signed running back Darren McFadden to a $60 million, six-year contract, making sure their first-round draft pick will be in training camp after JaMarcus Russell’s protracted holdout last year. McFadden, who finished second in the Heisman Trophy voting in each of the last two seasons, will be guaranteed $26 million as the fourth pick in the draft, said his agent, Ian Greengross. At 22, The Cowboys grabbed Felix Jones and paid him $10 million for 5 years, with $7 guaranteed…. How about that for showing why you don’t want to slide 17 spots because of a pre-draft injury? I think Ray Lewis will seriously consider leaving the Ravens. Will he go? Don't know. But my guess -- and it's an educated guess, nothing more -- is Lewis, who turns 34 in May, will not get a deal done with the Ravens before Friday, and he'll take a couple of visits on the first weekend of free-agency. Where? Dallas and the Jets are the teams that seem the most logical; I never thought under the salary cap they'd be able to clear enough room to go after a big player like Lewis. But the Jets, after some Chris Baker-type housecleaning last week, stand about $18 million under the cap this morning; I believe if coach Rex Ryan and GM Mike Tannenbaum wanted to, they could certainly afford both Lewis and fellow Ravens free-agent linebacker Bart Scott. The Cowboys are $12.3 million under. Wouldn't that be amazing: Ray Lewis with the star on his helmet. Or Ray Lewis coming to the Jets. Or Ray Lewis and Bart Scott to Jersey. Again, I'm saying this is an educated guess. But either one makes a lot of sense to me. 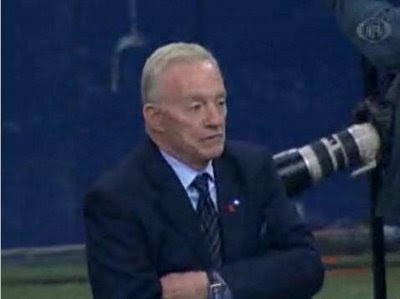 Jones always loves a new star, particularly with a tarnished team readying for a move into the new Cowboys stadium. Tannenbaum and owner Woody Johnson proved last year with the Brett Favre gambit that they're not afraid to take a chance on a big-name veteran. The Ravens without Lewis would be as different as the Colts without Manning, or the Yanks without Jeter. And had Baltimore known Lewis would have played as great as he did in year 13 last fall, they'd certainly have gotten this deal done last spring or summer. But now there are two teams in major need of defensive intensity and team leadership out there. Rex Ryan would love to have him in New Jersey, and I think Jerry Jones would view Lewis as the solution to all the me-first stuff plaguing his team. This could be a case where the Ravens -- with $19.4 million to spend under the 2009 cap -- might be forced to match a financial package that would simply be too much for the new Ryan-less regime to stomach. It'll be an interesting week in Baltimore. There's no long line waiting to pry Albert Haynesworth from the Titans. • He's never played a full season. He's started three, 11, 10, 14, 10, 12 and 14 in his seven seasons. • He's never played more than 65 percent of the Titans' defensive snaps in a season. You might say a Nnamdi Asomugha is tremendously overpaid at $15-million a year (much more on him later in the column), but Asomugha or a quarterback is going to play 95 percent of his unit's plays in the course of a year, barring injury. Even if healthy, Haynesworth's going to come off the field a third of the time, minimum. So do you want to pay quarterback money to a player who never touches the ball and plays two-thirds of the snaps a franchise quarterback plays? It makes no sense. • He's got a reputation for coasting on some plays. • He'll be 28 on opening day. You want to pay a 335-pound guy who's never started more than 14 games and is entering his eighth year $13 million or $15 million a year? Good luck. One of the keys to making it to the finish line this season is that the Stars are going to need to get results against the San Jose Sharks. With 24 games to play, the Stars still must play the Sharks 3 more times. Tonight, they play the final home game against the mighty Sharks, and then they must go to Northern California twice more. So far, they have pulled exactly 0 points from the Sharks. I think you could make a case that if the Stars get 0 out of the final 3 games, they will not make the playoffs. November 8: Stars lose 2-1 in San Jose, in a game where Marty Turco was phenomenal…until the final minute. In the final minute, he made what might not be remembered as his greatest moment of the season when he gifts Patrick Marleau with a beautiful pass, and Marleau dunks the puck over the goal line for a 2-1 win. November 28: The day after Thanksgiving, and to me, the lowest point of the season. I have seen probably 1,000 Dallas Stars games since moving to town in 1998, and this has to be in the Top 5 most humbling games I have ever seen this team endure. No matter how you slice this one, the Stars were embarrassed on home ice, 6-2. And the score might not have shown how one sided the game appeared to the naked eye. December 29: The Stars play a very solid game during a very solid streak of hockey. However, the Sharks are still 1 better (and then they add an empty netter to finish 2 better) in a 3-1 game. I remember actually being satisfied with the Stars effort, and pretty much saying after the game that if the Stars play that well, they will win most nights. After the game, the Sharks have a 25 point advantage over the Stars. Since then, the Stars feel they have played pretty well, right? They are 24 points behind the Sharks this morning, February 23rd. It is very important that the Stars figure out a way to get something tonight. This will take a colossal effort, because on paper, the Stars do not measure out. They have not lost regulation games back to back since that horrible roadtrip to Chicago and Boston back over Halloween weekend, and they need to avoid that here. Must.Get.Points. By any means necessary. The last time the Stars beat the Sharks? Game 6. 1:24 am. Cinco de Mayo. Morrow. Enjoy. No sooner do I congratulate Mikka Kiprusoff for save of the year, Marty Turco makes a bid! Turco has been sharp as a knife lately, and this Toews save is beyond crazy. I throw myself at the mercy of sports talk. With all that is holy in this land please spare me my sanity, the Cowboy season has been so over for so long now and all that can be debated has been repeatedly. I am a year one P1 I have the luxury of being able to wear headphones at work so I catch the Ticket for most of the day. The second I hear that name come up I look for what I can reach for faster the button on my walkman or my nail gun so I can shoot it repeatedly into my skull. I`m on my knees beaten and bloody begging of you please oh please. If nothing else thank you for letting me vent. The show rocks thanks for the ten years of mediocrity. I wish we could, but if we did a political talk show, we could not "stop talking about the war" because people are tired of it. The Cowboys are our country, and Owens is our War. Hopefully it will all end soon, and our boys can come home safely. Someday, if there is no war and no Owens, I will be quite happy. Today is NBA Trade deadline day. The Tyson Chandler deal is no more. And now, we are quite concerned with whether or not anything is going to happen. Especially, with the Mavericks, as many are saying nothing will go down. But, let’s remember how many times Mark Cuban has fooled us on this day. Juwan Howard? Nick Van Exel? Just never say never. Sefko says to not get your hopes up ..
"I don't know that there's a whole lot more that's going to be done," owner Mark Cuban said. "Everybody's looking to do the same thing, save money and to save cap room [for the future]. It's hard to do both." If the Mavericks pull off anything today before the 2 p.m. trade deadline, it is not expected to be anything earth-shaking. What their inactivity means – and what a general lack of movement throughout the league indicates – is that next summer is going to be outrageous in terms of teams trying to shed even more payroll. As Cuban said, when teams start realizing that season-ticket renewals aren't pouring in like they usually do, purse strings will get even tighter. Cuban tries to play the role of the owner who can pull the trigger when he thinks it's the right thing to do. But when the deals simply aren't out there, it makes doing nothing the only sensible course. Dallas Stars captain Brenden Morrow talks about his style of leadership, and the players and coaches who had the most impact on his career. A few minutes with Brenden Morrow make you really focus on that choir-boy look. But he's clearly a warrior, a throwback to when hockey players would play for the fun of it. He creates a presence on the ice. Impact follows him around. The "C" on his sweater can easily be taken for the character, compassion, competitive nature, creativity and the courage he displays every time he's on the ice. He's clearly a catalyst for the Dallas Stars. "He's the heartbeat of this team," Stars goaltender Marty Turco told me. "He's got the ability to dominate shifts, dominate games. "He's our captain, he's our leader. He's the sparkplug every team dreams of. He'll stand up to anybody, hit anybody. To say he's a warrior is kind of an understatement, with the attention he gets from opposing teams, the physical nature he plays with and the pure intensity that oozes from every pore of his body." "He initiates all over the ice. He infuriates the opponents with the impact he plays with," Mike Modano said. "He's an inspiration to us." Rangers rank #27 on this power Poll …behind the Nationals???? So, here we go again with another exciting game of “What did Jerry Just Say?”. It sure sounded like he was hinting that he is bringing that lunatic back. And if you don’t know who the lunatic is, just stop reading right now. However, those of us who are convinced that he must be done with the lunatic can only assume this is a last-ditch effort to secure some level of trade value before the March 3/June 3 deadline hits and a decision must be made. If you tell everyone he is not going to be with you, and then pick up the phone to work out a trade, the guy on the other end of the line will be fighting back laughter. Now, if you speak courageously, you might still hear giggling, but Jerry is trying to sell another used car. Right? I am right, here, right? I mean, the alternative is that Jerry is just as lost without a compass as he has ever been. Now "chemistry" seemed to strike a raw nerve with Jones, and when asked if he was worried about the reported "chemistry" problem on the team, Jones said, adamantly I might add, "Not at all. Not at all. Not-at-all. I'm just not. They are a figment of the result - you didn't hear about those kinds of things when we were winning. You hear about those kinds of things when you're losing. So I'm just not. And if you all knew more about some of the things you're writing about, you wouldn't be as concerned." And when told his fans are not happy, and they don't seem to have anything to be optimistic about, not as optimistic as he seemed, well, Jones had an answer for that one, too. "I make comparisons," Jones said. "I look at other sports, I look at other teams, I look at the fact there was one team (in the NFL) that's satisfied today, one, in my mind, and that's the Pittsburgh Steelers. The other one that ought to be the next most satisfied won nine games and lost seven and played well in the playoffs. (The Cardinals) had a tough time in their last five games and yet they were almost world champions. "So I would say to the fans that are (frustrated), I'm as disappointed, and resolved as you could ever imagine to do the best job of putting a team on the field. Winning will make people happy . . . winning will make 'em happy. I don't know that there's a player right now who could take the disappointment away from the equation. The only thing that's going to take the disappointment away is to win ball games. That's what we're going to try to do." But I know, just like us guys, you guys want to know about Terrell Owens. Is he staying or is he going? Again, Jones isn't saying, although before the press conference was over, he did kind of cryptically answer the question, leaving himself open for interpretation, which he has been dearly trying to avoid on this subject. So for starters Jones, when asked about if it's one of the tougher decisions he's had, deciding what to do with Owens, said, "I don't know that it's any tougher than decisions we've made, that I've made over the years . . . no tougher. There are several decisions on our roster that you look at, that you have to. This is the time of year you do that, and I'm not trying to be trite, but as you all know we're evaluating players in college, we're evaluating (free agents) and we're evaluating our own roster. This is an ongoing thing. Not any different than this time last year. Not one bit different." Ah, but it was pointed out last year he signed Owens to an extension, adding three years to the final year of his contract and handing him $13 million in guaranteed funds. "That's what I'm saying, this is not one bit different . . . not one bit different," Jones said. Ah-ha, and this is why it's wise for Jones not to address this subject, leaving himself open for interpretation because the next question was, so you are acknowledging you do have a decision to make? "No I'm not, no I'm not at all," Jones said. "I'm just saying we're not, I'm not talking about what we're doing with our roster, and you guys got the roster and know the people on the roster and so I don't have to go into that. Our roster is our roster, and changes to that are pure speculation and have been." And then came maybe his first salty response, Jones bringing this up on his very own, knowing there have been reports out there about how he's invited players to his house to discuss the viability of keeping Owens. "And by the way," Jones said without provocation, "I would like to have seen anybody who has come over to my house to visit about our roster - another player. That hasn't happened - haven't been near my house to visit about another player on the roster. I heard that speculated, that I've had people come over - players come over and talk about it. That just hasn't happened." But the sparring didn't end there, and by the way, Jones did say he has not spoken with Owens' agent Drew Rosenhaus about anything this off-season pertaining to his client's continued employment out here. But before the session was completed, Jones alluded one more time to Owens, without even mentioning his name, maybe adopting the Bill Parcells philosophy of not using his name when referencing the wide receiver. "So that's what we're trying to do here, kind of manage that," Jones said when talking about how frustrated and mad everyone seems to be with what happened last year. "It has nothing to do with the information. You'll get every bit of the information that you should have. You and I both know that the one you are asking about all the time, if I have an answer for . . . if I gave you the answer you want to hear, then you would already have had it, so the fact you don't have it ought to tell you something. Or it should." The excitement in Lubbock rages on …. Texas Tech's 5 p.m. deadline Tuesday given to football coach Mike Leach to sign its latest contract extension offer came and went with still no resolution. Myers said in a statement Tuesday. "We will enter the decision-making process and should have some announcements by next week. Our decisions will be based on the best interest of Texas Tech and all of its supporters." The Texas Tech Board of Regents, however, announced Tuesday a "special called teleconference meeting" from 2 to 3 p.m. Friday, when in executive session, they will have a "discussion and consideration of matters ... including but not limited to the position of the football head coach." In a phone interview Tuesday evening, Leach was asked if he was worried about being fired. "Not really," Leach said. "We have an agreement both parties signed. We agreed to do two more years, and I don't see how that could be unsatisfactory to anybody. Why anybody would have a problem with two years left on my contract, I don't know." He admitted disappointment with the events that have led to this point. "Yeah, me and a lot of people are," Leach said. About 40 people showed up at a rally on Leach's behalf just before noon Tuesday at the school's football offices in Lubbock to show their support. Leach, who returned to Lubbock late Monday after attending a rugby match in Wales on Saturday and the Daytona 500 on Sunday, briefly addressed the crowd, many of whom were students holding signs. Really? Leach went to a Rugby match in Wales on Saturday, and the Daytona 500 on Sunday? That is a tough-to-predict sports weekend with the fellas. And now, with the NBA Trade-deadline just 1 day away, it is time for another episode of “This trade makes no sense!” …starring the Hornets! The next 24 hours are going to be interesting, but let’s now understand something quite clear: These trades are not about anything but cash. New Orleans wasn’t happy with Tyson’s season, but you don’t give up a promising 26 year old big less than 1 year after your playoff run unless you are hemorrhaging money. It was very noble of them to stay in New Orleans, but isn’t it far to ask if the economic model of an NBA Franchise can work there in these trying times? Mark Cuban – be a vulture if there are sales like this to be had. There is no guarantee these sales will last forever. As franchises go, the Hornets have the most streamlined front office in the NBA. Beyond the practice gym, there are modest connecting offices with thin walls between Bower and his assistant GM, Brian Hagen. There’s the front office, just a GM and his assistant. The Hornets have two full-time scouts on the road. And that’s it. Most teams have three and four times the personnel, but not the New Orleans Hornets. They’re the barest-bones operation in the NBA and yet under Bower they’ve shown themselves to be a model of resourcefulness and resolve. George Shinn is the one NBA owner without another industry where he makes his money. The Hornets are his business, and Shinn runs this organization like the corner Mom and Pop. The Hornets hire cheap, and hire cheaper when those talented people move up and out to the rest of the NBA. Against all odds, bouncing between Oklahoma City and New Orleans, Bower made the Hornets one of the most thrilling young teams in the NBA and a contender in the Western Conference. Maybe the greatest validation of his work was the that Paul passed on a chance to become a free agent, a chance to leave perhaps for the cash-flushed Portland Trail Blazers and signed a contract extension with the Hornets. So, yes, it felt odd to click to the Hornets’ team website on Tuesday night, and next to the modest administrative masthead, there were links to several non-sanctioned New Orleans’ blogs. In the middle of it all, there was a photo of Bower with the word “MORON” stamped on his forehead. Yes, this abuse is part of a GM’s job, but the shortsightedness from die-hard Hornets fans had to leave even fair-minded folks exasperated and thinking: Come on, you think Bower desperately wanted to trade Tyson Chandler to the Oklahoma City Thunder for Joe Smith and Chris Wilcox? “Teams like us have to be able to get value for our players,” Bower said by phone Tuesday. Yes, the Hornets payroll would’ve been over $76 million next season with the 7-foot Chandler on it. Still, New Orleans is 30th in the NBA in rebounding, and Chandler, who blossomed into a terrific pro as a Hornet, had lost productivity and an ability to stay healthy. As much as people wanted to portray this trade as a pure salary dump – and yes, that had a lot to do with it – Bower was still banking that he had gotten the most out of Chandler and it was time to reshuffle his frontcourt. Across the NBA, the landscape is dramatically changing. The excess of old is going fast, and those unable to get fit in the short and long run promise to pay a steep price. The luxury-tax threshold will drop lower next year. Season tickets, corporate sponsorships and arena suite renewals could be off 50 percent. Owners are desperately trying to dump salary, and the haves are determined to fleece the have-nots on talent that richer teams can afford. SportsBusiness Journal reported the NBA just secured an additional $175 million league-wide line of credit – on top of the $1.7 billion it had – to assist the 15 teams that told the commissioner’s office they’d like to tap into the fresh borrowing. Three NBA front office executives told Yahoo! Sports on Tuesday that it’s believed as many as seven NBA teams could need that money to cover operating and payroll costs by the summer. Do I have some of the kindest fans in the world? It'll only make you feel stupid. Howard is DESTROYING Okafor. For the record, I have already admitted how poorly I got my 2004 NBA Draft thoughts over and over again. Not only did I get that one wrong, I got it waaaaaaaaaaaay wrong. But, I don’t share my email account with my wife. Bro, you might need to change that address. Okafor 14 and 9. Pretty good, right? Well, Howard had a fair night, too. 45 points, 19 rebounds, and 8 blocked shots. Good Gracious. This is new territory for Brad Richards. In the 629 regular-season games his NHL teams have played, Richards has dressed for 619 of them. So being out for six to eight weeks with a distal radius fracture in his right wrist is a bit depressing. But Richards, who injured the wrist Monday when it was pushed awkwardly into the boards in a 3-2 win over Columbus, said Tuesday he is trying to be optimistic about his recovery. "I'm going to prepare myself for the best," said the 28-year-old center, who ranks second on the Stars in scoring with 48 points. "I've never been through anything like this before, so I know it's going to be tough. But I watch someone like Brenden [Morrow], and I see how hard he's working, and I'm going to take the same approach." Morrow is out for the regular season after reconstructive surgery on his knee but is with the team every day and is pushing to return in late April. Richards will not require surgery but will wear a cast for four weeks and then have the wrist re-evaluated. If he is able to return in six weeks, he could play in seven games before the end of the regular season. If it's eight weeks, the Stars would have to make the playoffs for his return. "I would like to play as many as I can," he said. "I know there's a lot of the unknown out there, and I know that we'll know a lot more when the cast comes off, but I would love to be able to play for two weeks." The Stars, meanwhile, dealt with the injury by recalling Chris Conner from Peoria. They also expect to get Landon Wilson back from a rib injury soon and will move forward without significant changes.